Homeowners, Kelly and Joseph L., both grew up in the Cherokee Park area and knew they wanted to raise their four children in the same area. They had very specific desires and spent more than 5 years looking for just the right house. Once they found it, they knew exactly what they wanted to do. Working with architect Dan Fultz, the homeowners expressed their desires for an addition that blended with the existing structure and fit the neighborhood. They wanted a large family room and kitchen to host family gatherings regularly consisting of 40-50 people. Also on their list was plenty of light and the ability to bring the outdoors in. Fultz delivered on all their wishes and more. And, the homeowners called on Doug Amlung of Amlung Construction to bring their dreams to life. In addition to the new family room and kitchen, the plans included a basement extension with 10 foot ceilings and a master bedroom and bath on the second floor that features a stunning arch window designed by Fultz. Amlung and his team of craftsmen and highly skilled subcontractors created a showcase addition that looks totally at home on the existing structure. The work quality is outstanding making it nearly imperceptible to tell where the existing structure ends and the addition begins. The homeowners love the new windows and doors. 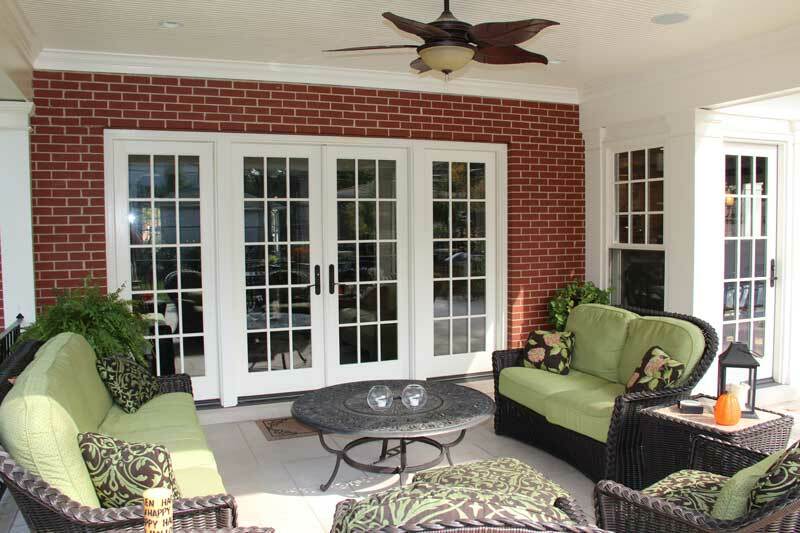 “We have these great French doors that allow us to move furniture in and out, there are no winter drafts, the windows open and close easily and they are easy to clean,” says Kelly. “I just love that I can lie in bed and the moon shines on my face through the beautiful arch window…it is perfectly positioned and my favorite window of all,” Kelly adds. With more than 20 new windows and doors, keeping track of sizes and details was important for the success of the project. Amlung credits his Door Store and Windows consultant, Don Erickson, with having great vision for what was needed from bid process to final delivery, even knowing how to match the existing windows to retain the character of the house. That vision is something Amlung feels is only found at a window company like Door Store and Windows.